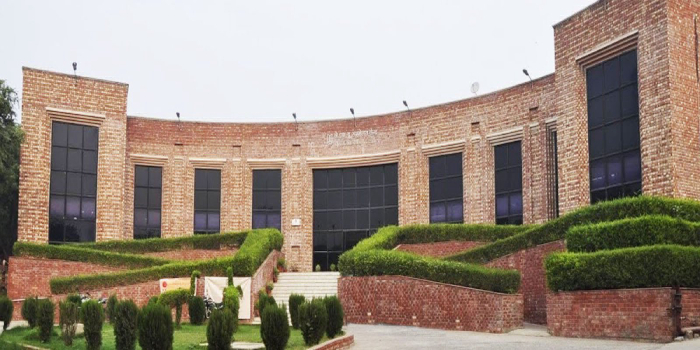 JNU Admission 2019 – Jawaharlal Nehru University, Delhi has announced that the entrance test of JNU 2019 admission will be conducted from May 27 to May 30, 2019. Earlier the JNUEE 2019 was set to be held from December 27 to 30, 2018. The JNU entrance test 2019 will be held in collaboration with NTA - National Testing Agency. Jawaharlal Nehru University will conduct an entrance test for admissions of JNU 2019 in a computer based mode. Candidates interested to pursue the different undergraduate and postgraduate programmes offered through JNU admission 2019 must attend the JNU entrance exam 2019. The university offers various programmes for which the candidates can apply by filling the application forms of JNU 2019 admission. Jawaharlal Nehru University will offer admissions in a total of 37 postgraduate programmes for 3,383 seats with the help of JNU admission 2019. The admission in JNU 2019 is offered based on merit which will be determined as per the performance of the candidates in the entrance test. The merit list and cutoff for JNU admission 2019 will be different for different programmes offered by the university. Candidates can check the cutoff and merit list of JNU 2019 admission online itself. Jawaharlal Nehru University conducts JNU CEE every year for candidates who wish to seek admission in JNU. JNU has released a notification regarding the entrance examination and its weightage for JNU admission 2019. JNU will conduct JNUEE 2019-20 from May 27 to May 30, 2019 in collaboration with National Testing Agency. As per the news released by the media JNU will be the first central university in the country to conduct the entrance examination with NTA. JNU has announced regarding a delay in the announcement of the JNU Entrance Examination on November 11, 2018. JNU first announced JNU Entrance Exam dates on October 23, 2018. 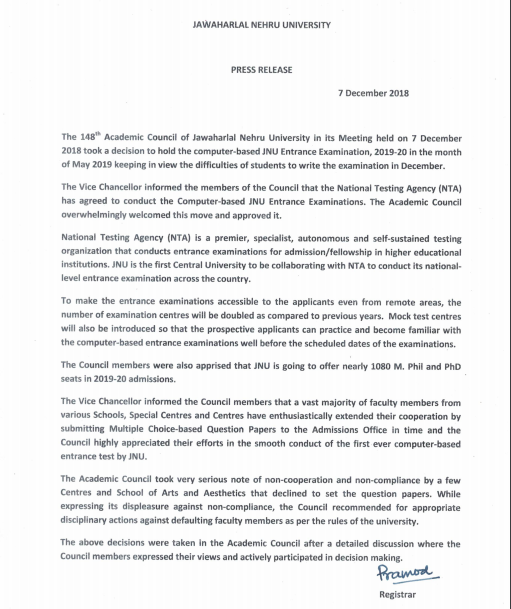 The Exam was supposed to be conducted on December 27-30, 2018 in a computer based mode. JNU has announced the important dates of JNU 2019 admission for the admission test to be held for the various post graduate courses offered by the university. JNU 2019 important dates will help candidates track the different events related to the admission process of Jawaharlal Nehru University. Jawaharlal Nehru University will conduct JNUEE 2019 for candidates who wish to seek admission for the undergraduate and post graduate programmes offered by the university. Candidates need to fill and submit the application forms of JNU admission 2019 before the last date of submission. Only those candidates who complete the application forms of JNU 2019 admission successfully will be able to attend the entrance examination for JNU Admission 2019. After the commencement of the entrance examination, the university will declare the result of JNUEE 2019. Following the declaration of the results, the university will release the merit list based on which qualified candidates will have to fill and submit the admission forms of JNU 2019 admission on the basis of which the admissions will be offered. Jawaharlal Nehru University will list the eligibility criteria of JNU admission 2019 for the different programmes offered by the university. Candidates who wish to apply for the courses offered by the university must make sure that they qualify the eligibility mentioned for the particular course. The minimum eligibility for the undergraduate programmes is 10+2 with minimum marks mentioned while the eligibility for the postgraduate programme will be 10+2+3 from a recognized university with minimum marks specified by the university. The Application forms for the JNU 2019 admission to the different programme were available from March 15, 2019. Candidates were required to fill and submit the application forms of JNU admission 2019 before the deadline mentioned by the university, which is April 18, 2019. The JNU 2019 application form will be available only online. Candidates filling JNUEE admission form are required to start by registering themselves online for the Jawaharlal Nehru University Common Entrance Examination. They have to provide the details such as name, date of birth, address and contact details besides providing their email id, password and photograph and signature. Candidates have to pay an application fee for JNU admissions 2019 online using Credit Card/ Debit Card/ Net Banking payment options. After completely filling JNU 2019 application form, candidates have to take a print out of the filled-in application form for Jawaharlal Nehru University Entrance Examination (JNUEE/ JNU CEE) and keep it with them until JNU 2019 admissions process is completed. Candidates must also note that there is no need to send a copy of the application form via post. The number of test centres for JNU 2019 admission is 2.5 times more than the previous year exam centres. The exam centres of JNUEE 2019 included Allahabad, Bangalore, Chennai, Delhi, Ghaziabad, Gwalior, Goa, Indore, Jammu, Kolkata, Lucknow, Mumbai, Patna, Pune, Ranchi, Shimla, Thiruvananthapuram, Udaipur, Varanasi and Vishakhapatnam. Apart from these JNU exam centres, the central university also provides an overseas exam centre in Kathmandu for the candidates who wish to appear for JNUEE 2019 admission overseas. However, candidates must note that the JNU 2019 exam centre of Kathmandu is subjected to availability of a sufficient number of candidates for the JNUEE centre. Candidates must also remember that Jawaharlal Nehru University reserves the right to cancel or change any exam centre of JNUEE for any reasons. 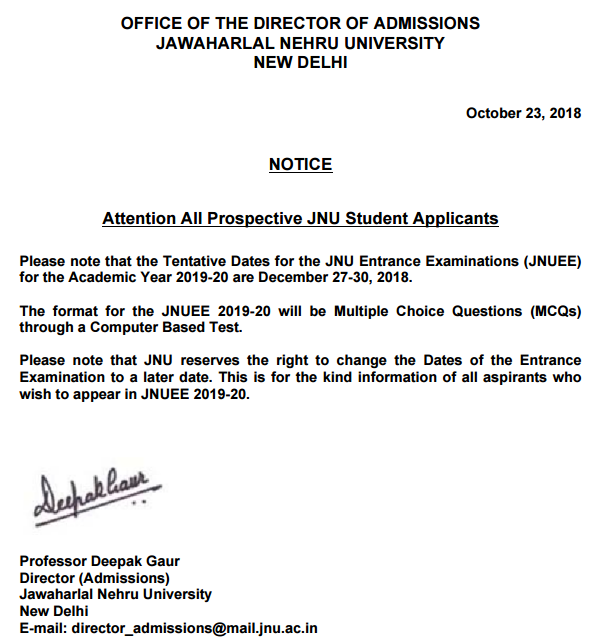 Further, candidates must also note that the JNU exam centre once allotted to a candidate will not be changed under any circumstance or any request by the JNUEE admission aspirant. 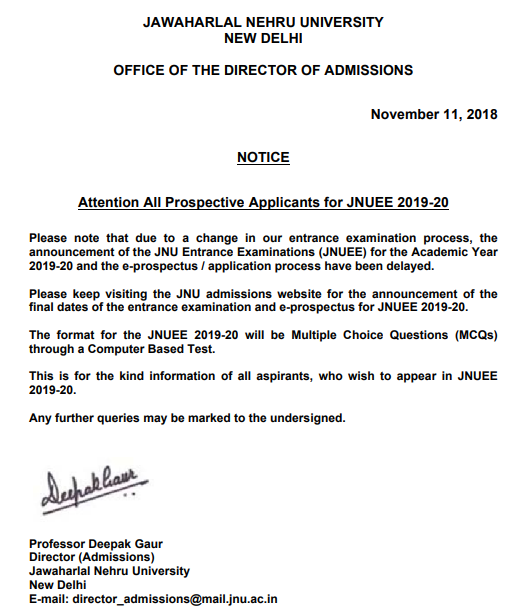 The admit card of JNUEE 2019 admission will be provided to those candidates who successfully complete the application process. The admit card of JNU 2019 admission will contain the details such as candidates name, date and timing of examination, a photograph of the candidate along with the exam centre details and a subject of choice. The admit card of JNU admission 2019 will be available online only. Candidates must note to keep a copy of the admit card in hand until the admissions process is completed. JNU Entrance Exam 2019 will be conducted from May 27 to May 30, 2019. Candidates can check here the exam pattern for the different examinations. JNUEE 2019 will be conducted in an online mode. Candidates will have to answer questions (objective or subjective) in the given time. The examination pattern of JNUEE 2019 will differ as per the subjects the candidate is appearing for. Negative marking will be applicable only for a certain number of subjects (subjects with objective type questions). Various Schools under Jawarharlal Nehru University offer as many as 37 postgraduate programmes. The schools offering different programmes include School of Arts and Aesthetics, School of Biotechnology, School of Computational and Integrative Sciences, School of Computer & Systems Sciences, and School of Environmental Sciences, besides School of International Studies, School of Language, Literature & Culture Studies, School of Life Sciences, School of Physical Sciences, School of Life Sciences, School of Social Sciences, Centre for Molecular Medicine and Centre for Sanskrit Studies. 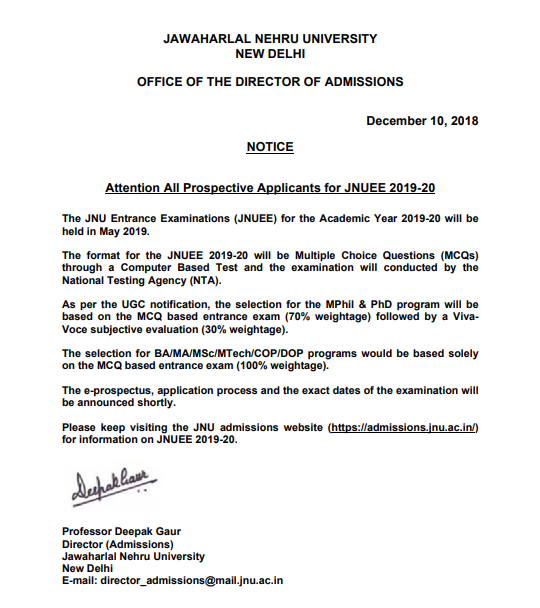 The sample papers of JNUEE 2019 will give candidates an estimate of the type of questions asked for the examination. Candidates can download the sample papers here for the different courses. The sample papers containing the original question paper of different courses will help candidates to understand the trends and types of questions asked for the different subjects. Solving question papers will help candidates to time their tests well and understand their strong and week points to work accordingly over the same. While preparing for any examination it is necessary that you prepare a plan of how to you will take your preparation forward. Set a few goals for each chapter which will help in covering the syllabus with ease. Notes are what guides you through your studies. While going through ease concept prepare small notes which will help you remember the concept well. Previous years question papers will help you to manage time and focus on your strong and weak points through the exam. Solving sample questions in will bring you face to face with the type of questions that could be asked in a particular subject. The result dates of JNUEE 2019 will be declared ver soon for all UG and PG programmes. Candidates will be able to check their result online by logging in to the website or referring to the link given here. To check the results candidates need to enter their login credentials which include the application number, programme of choice and the school of choice. The merit list of JNU 2019 admission will be declared by the University after the results are declared. The merit list of JNU admission 2019 will mention the list of candidates along with their marks ans rank secured for the different programmes offered by the University. Candidates whose names feature in the merit list will have to attend the counselling procedures. The cutoff of JNU admission 2019 will mention the minimum marks required by candidates to qualify for the different programmes offered by the university. The cutoff of JNU admission for the different programmes will be made based on total number of applicants for a particular course, the difficulty level of the examination and the previous years cutoff trends. The university will declare around two cutoff lists so candidates must make sure to keep tracking the same. Candidates can check here the cutoffs of JNU 2019 admissions for each programme. Jawaharlal Nehru University will conduct the counselling process for those candidates who have qualified the entrance examination. The counselling of JNU 2019 admission is the process where in the documents of candidates who have qualified the entrance examination will be verified after which the candidates can take admission for the course allotted to them by paying the fee. Given below are some frequently asked questions by JNU aspirants which will help future candidates in understanding the JNU admission process. Q: Can candidates who are in their final year UG apply for JNU Entrance Exam? Ans: Yes, Students who are in their final year of UG programmes can also appear for the entrance examinations. Q: Can corrections be made in the application form of JNU admission 2019? Ans: Corrections can be made in the application form of JNU 2019 admission by the candidate before the application fee payment process. Once the fees is paid there is no provision to make any correction since the application will be considered as submitted. Q: What is the medium of JNUEE 2019? Ans: All the entrance examinations will be conducted in English. Q: Can a change in exam centre be requested after the exam centre is alotted? Ans: No, there is no provision for changing the examination centre. Candidates must also note that they have to take the exam from the centre alotted to them. They will not be considered at any other centre. Q: Will the application forms of JNU admission 2019 be available offline? Ans: The applications forms of JNU 2019 admissions will be available online only. Q: What is the minimum marks required by candidates to apply for JNU courses? Ans: Candidates must score minimum 50 to 55 percent marks in their qualifying examination as per the category they belong to.